Did you know that Greeks are among the highest consumers of cheese in the world? Per person the average Greek consumes about 23 kilograms of cheese a year. Why? The answer is feta. Feta cheese that is. Half of that cheese consumed is feta. Yes, Greeks love and know their feta. Feta is a brined cheese (it is placed in a brine solution) that is made either only from sheep’s milk or a combination of sheep and goat milk. It is aged in the brine minimally 2 months, but the good feta will be aged 12 months. Feta is a cheese that is a Protected Designation of Origin product (P.D.O.) in the European Union. That means that only feta made in specific areas of Greece with a specific method can be called “feta”. 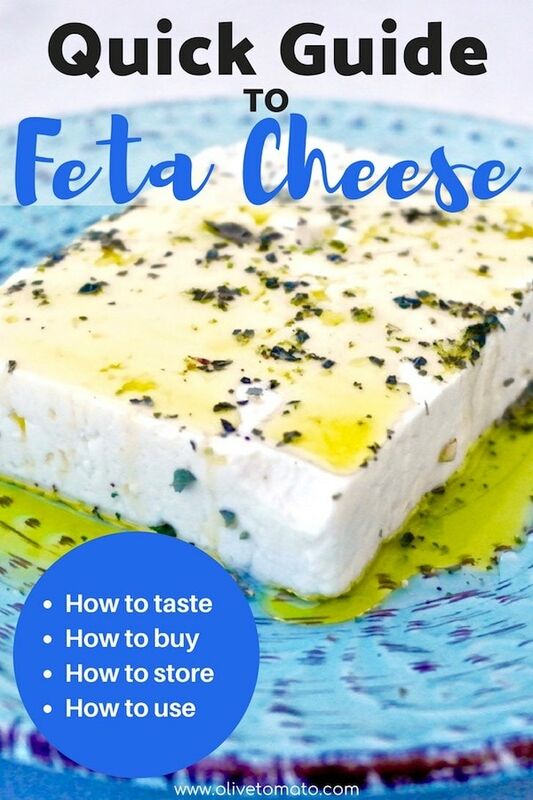 Unlike in the U.S. where you find many cheeses called feta even if they are not Greek, or made traditionally or even with the right ingredients. For one, you often see “feta” made with cow’s milk, which is a big no-no. Feta made with cow’s milk can sour easily, develop a mushy texture, crumble easily (not in a good way) and have an unpleasant aftertaste. What Does Feta Taste Like? Feta has a tangy, rich and slightly salty flavor. The more aged it is is the more “peppery” and hard it is. Feta made mostly with sheep’s milk will have a more rich buttery flavor, while goat cheese makes the cheese harder and milder in flavor. Although a brined cheese, it has many characteristics of a “fresh” cheese. 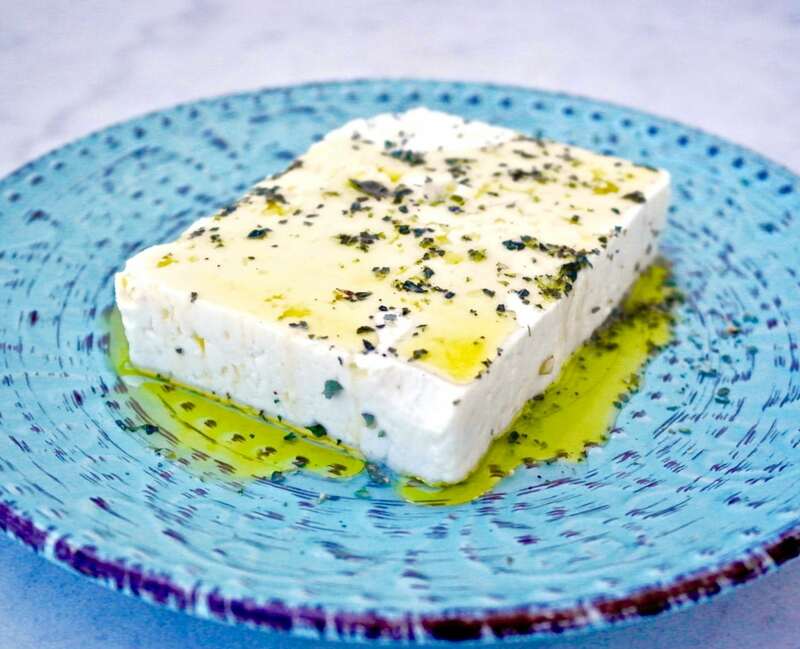 Feta has an intense flavor and you can use less of it with good results, it is naturally lower in fat by weight from other cheeses because it has a high water content, it is also generally lower in calories than other intense flavored cheeses. It is a good source of calcium, phosphorus and protein. Contrary to what you have heard, most feta available for sale in the super market is made from pasteurized cheese (not unpasteurized). Feta is so versatile, that it tastes great almost anywhere it is added. • Eat alongside a vegetable based dish. • Add it to fresh salads. Feta is a perfect accompaniment to tomato but also goes well with all sorts of greens including lettuce, fresh spinach but also beets. • Combine it with meats and cook it in the oven. • Smash it with a fork until creamy and use it as a spread in sandwiches. 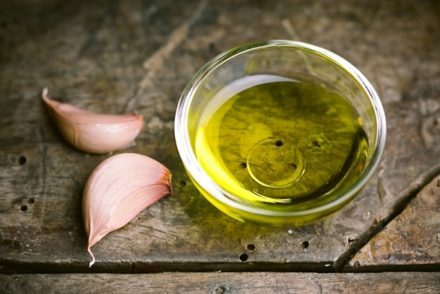 • Use it as a topping for pizza or bruschetta. • Make a sandwich using sliced feta, oregano and olive oil. • Bake feta along with some peppers for a spicy appetizer. *For more tips and ideas on using feta click here. Feta should be stored in a brine solution, otherwise it will go bad quickly. You can make your own brine, by adding 2-3 ounces of salt to 1 liter (about 4 cups) of water. Make sure the Feta is completely covered in the solution. Keep in a closed container. It can last like this for about 6 months. Feta that is not stored this way, especially crumbled feta will last only a week (tip: do not buy crumbled feta). 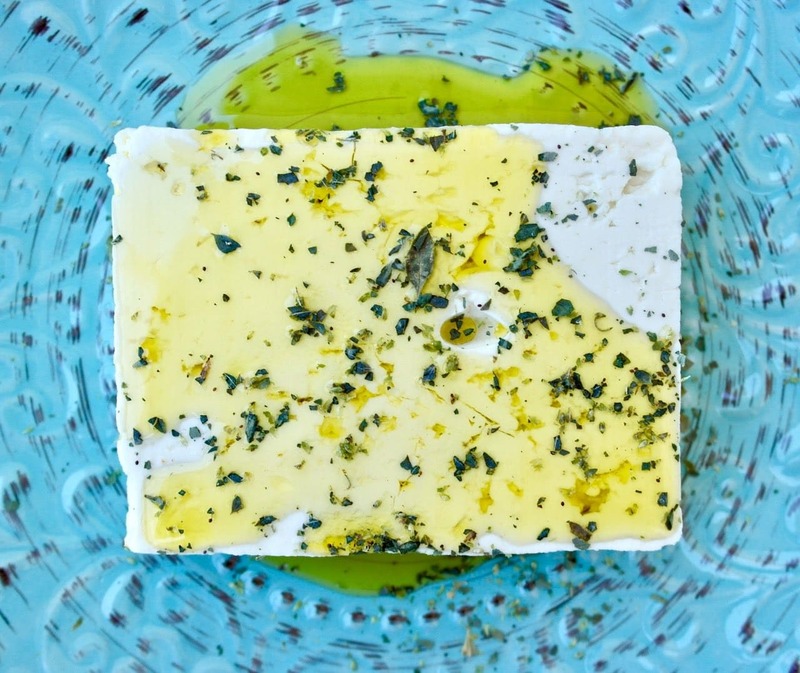 What Makes Feta so Important to Greeks? Well, it is not only an accompaniment to a dish, or consumed after the meal like the French, it is actually part of the whole meal. In the same way that bread is present at every meal, feta is also present. As the traditional Greek diet is rich in vegetable based dishes, feta served as the protein to those dishes. 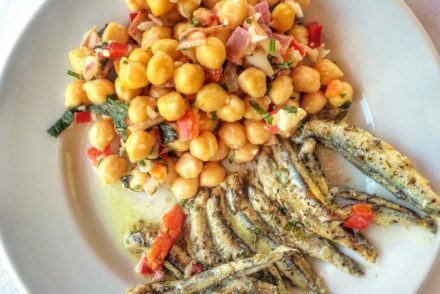 In addition, the freshness and tanginess of the cheese balanced out the richness of olive oil in which these vegetable dishes were cooked. But feta manages to find its way as an accompaniment to almost every single other food too: meats, beans and fruit. The only thing they usually will not eat it with is fish. Thanks Elena, I’d not considered using smashed feta as a sandwich filling. 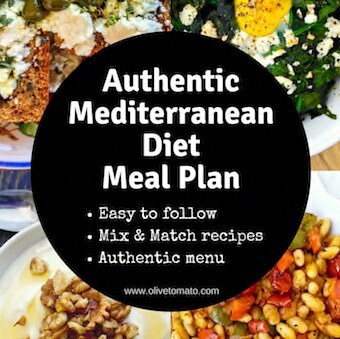 I’m enjoying eating it with beetroot (like you would do with goat cheese) and also with watermelon- we’re having a heatwave here in Europe at the moment so it’s perfect now, lol. You often find ‘salad cheese’ here as well as authentic Greek feta. Similarly in the UK you find ‘grilling cheese’ in place of genuine Cypriot halloumi- it makes my blood boil, haha. After staying about a month in Crete in the early 90s, I have yet to find any feta that matches the taste in the USA. I guess I will have to go visit again. There’s a reason why Feta is the most popular of Greek cheeses, especially outside of Greece. This cheese is a staple in our home! 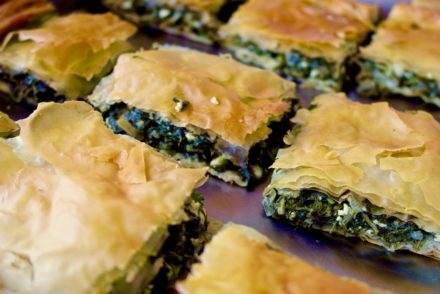 We cook with it (like in tiropita or spanakopita), put it in salads, and just eat it plain! It has so many great uses. Great tips! Would you be able to do a round up on all Greek cheeses that are now more popular in main stream stores. For example myzithra, kefalotiri, halloumi, etc. Thanks Ellen! Great idea for the round up of Greek cheeses. Great article! Now I get why some Feta is creamier than others! Thanks! Great article. I learned a lot! Thanks much! It’s not surprising Feta is so central in Greece. It’s explosive on the taste buds, tangy and salty. You can wash a lot of the external salt off before consuming (if that’s a worry + if you intend consuming within days). It’s a cheese you will never regret trying. If, like me, you’re watching your weight and love cheese then it’s an absolute godsend. It’s lower in fat than most aged cheeses (c. 25% less), easy to crumble onto sandwiches or salads, so tasty that a little goes a long long way (reducing fat intake even more!). I use it to replace sharp aged cheeses where expected, e.g. cheddar and gouda. Of course, make sure you’re getting Greek Feta – other types made with cow’s milk will not be remotely similar.